NW Bulldozing & Hydroseeding LLC provides professional and affordable hydroseeding services to contractors and home owners in Kitsap County, King County, Pierce County and Mason County Washington including; Seattle, Bremerton, Bainbridge, Silverdale, Belfair, Tacoma, Port Orchard, Gig Harbor, Shelton, Lakewood, Spanaway, Puyallup, Federal Way, Kent, Bellevue, and surrounding areas. 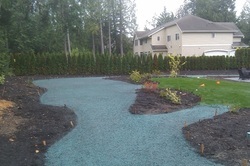 We specialize in hydroseeding, allowing you to have the perfect lawn you've always dreamed of. 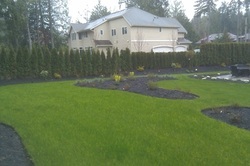 You can have a beautiful new lawn at a fraction of the cost of sod with our hydro-seeding process. Grass seed, fertilizer, tackifier and mulch are mixed with water to create a thick slurry which is evenly sprayed onto your prepared soil with a hose up to 400 feet long. Once your lawn has been hydroseeded, the grass seed and fertilizer are protected by an attractive green layer of hydro mulch that seals in moisture creating the perfect micro climate for the seed to germinate and also helps prevents wind and rain from eroding the soil and washing away the seeds even on steep banks. Because the seed was soaked with water in the mix, much faster germination will occur. Hydroseeding allows you to have a lush, emerald green lawn in days. It is grown in place to your soil conditions. There is never a problem with it not "taking" which can be a problem with sod. If your Hydroseeded lawn does not establish properly, for up to one year, because of product or workmanship, those portions of the lawn that are not growing will be re-seeded, at NO COST! Be sure to water, fertilize and maintain your new lawn as directed on our website. If your lawn is not watered, fertilized and maintained as directed, the Warranty is void. The Warranty does not cover a lawn that has not been properly prepared with new top soil, that is washed out because of heavy rain fall, lacking proper growth because of lack of fertilizing, or burned because of over fertilizing, using the wrong fertilizer or the improper use of chemicals to kill weeds. Warranty applies to lawns planted between April 1st and October 10th. Hydroseeding typically costs less than 1/5 the price of sod. Sod can be expensive, especially when labor is factored in. Hydroseeding requires less installation time and less material, which means you can have a healthy lawn for a fraction of the cost. Hydroseeding costs 2 to 4 times more than conventional broadcast or drill seeding. But one needs to remember that hydroseeding includes mulch to protect the seed, fertilizer, and tackifying agents to reduce the likelihood of erosion from rain and wind. Conventional seeding often requires two or three sowings before a lawn is successfully established. Hydroseeding is often a better value than broadcast or drill seeding. Hydroseeding results in much healthier grass because the root system develops in the soil from seed. Sod has to be transplanted and often experiences shock in foreign soil. Hydroseeding provides a specially formulated growing medium resulting in fast germinating, healthy grass. And it is because of this same growing medium that hydroseeded grass has a significantly higher germination rate than grass seeded by traditional methods. Additionally, site-specific seed can be used in the mix, including native grasses and Shade mixes. This means you get a “custom lawn” instead of whatever the sod farm happens to be growing in a given year. Our standard mix is a blend of Perennial Rye and Fine Fescue. We use the following JB Seed mixes for most of our hydroseeding projects. Custom Mixes are available. Hydroseeding is the only method of turf establishment that effectively retains moisture and protects from adverse weather conditions. This is due to the ingredients of the slurry. Unlike conventional seeding and sod, hydroseeding has less rigorous watering demands, is more tolerant of drought and wind, and better withstands conditions that lead to washout. Hydroseeding provides the ideal environment for germination and erosion control. For areas where there is significant slope and risk of erosion, special bonding agents and engineered mulches can be used to give results equivalent to an erosion control blanket. 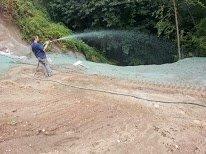 To learn more about hydroseeding for erosion control click here. Hydroseeding can be applied easily with up to 400 feet of hose to slopes and wet, frozen, or bumpy soil and areas that may be inaccessible by conventional means. This means that the window for establishing grass is greatly extended past that of placing sod or seeding by traditional methods. Serving the hydroseeding needs of Kitsap County, Pierce County, King County, Jefferson County, Seattle, Ft Lewis, Bangor, Mason County, Gig Harbor, Keyport, Bainbridge Island, Belfair, Allyn, Kingston, Port Orchard, Silverdale, Poulsbo, Tacoma, Lakewood, Federal Way, Auburn, Kent, Puyallup, Spanaway, Bremerton, Fife, Port Ludlow, Sequim, Port Townsend, Chimacum, Port Gamble, Hansville and surrounding areas.